Cookie cutter articles are routinely written that proclaim that “the Facebook sidebar is a wasteland” or “mobile is where it’s at on Facebook.” They’re all wrong. In this post, I’m going to explain why before presenting my own data to show you what I’m seeing regarding the evolution of CPM costs and Cost Per Page Like by placement, dating back to August of 2013. Reports come out regularly that give us an idea of the trending costs and performance of Facebook ads. They are interesting, but they are nothing more than a mash-up of hundreds of advertisers. But do not let these reports guide your advertising habits. Focus on your results only. The truth is that the Facebook advertising landscape is constantly evolving. Costs will go up and down based on competition. And what you see may not be what I see depending on industry, audience, copy, imagery and a long list of factors. Something else to consider is that advertisers are often distracted by the wrong data. Don’t be one of those advertisers. For example, your Click Through Rate on the sidebar may be awful. It probably is. But it’s generally much, much cheaper to reach users in the sidebar, too. In the end, the only metric that truly matters is your Cost Per Desired Action. Everything else can cloud the picture and lead you down the wrong path. I’ve heard more times than I can count that you shouldn’t advertise on Facebook’s sidebar. In fact, I’d estimate that 9 of 10 advertisers I talk to completely ignore it in favor of the News Feed. But I’ve found that the sidebar works just fine. In fact, back in November I reported seeing that the sidebar was more effective than mobile for getting page likes, registrations and even sales. As with everything, things change. It’s why I suggest that you constantly monitor your results to optimize based on what is working and what isn’t. I decided to pull all of my results dating back to August of 2013. The reason I selected this starting point is based on sample size. I started investing close to a minimum of $2,000 per month starting in August. I ran two reports to get a better handle on costs based on placement. Know that you can run a similar report using your Facebook ad reports. Since competition will differ wildly depending on placement (I previously found that the cost to reach users on the sidebar was 1/20 of Desktop News Feed and 1/50 of mobile), I then found the CPM for each placement. Next, I focused only on my page like ads run during these months to track the cost of a page like by placement over time. As you can see, I spend about 45% of my ad budget on building a relevant audience. It’s first important to note that I use Optimized CPM almost exclusively. 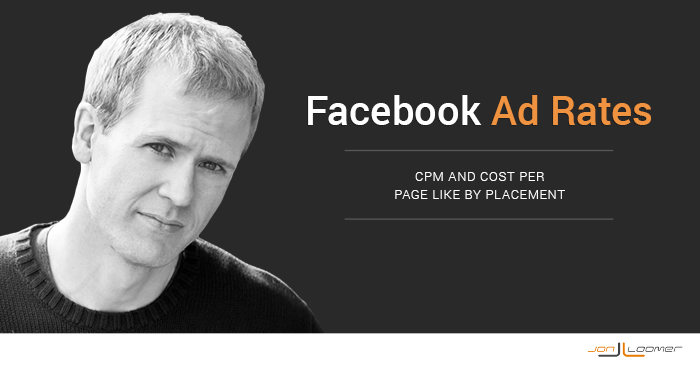 If you aren’t familiar with oCPM, this is Facebook’s default bidding method. Facebook will optimize your audience, showing your ad to the people most likely to perform your desired action. Your bid is also dynamic, as Facebook will bid what is necessary to reach that audience (budget and audience size being important factors). As a result of using oCPM, my CPM prices will always be significantly higher than advertisers who use manual bids. But I’m confident I also get the corresponding “optimized” results (see my study on using oCPM over CPM). Additionally, I promote to audiences of varying sizes, from a few thousand to several million. The size of the audience will also impact the cost to reach those people. As you can see, I saw CPM drop steadily across all placements from August through December, but it then rose quite a bit beginning in January. Previously, the cost to reach users on mobile devices was significantly higher than the cost to reach them in the desktop News Feed. Beginning in December (January being the exception) that is no longer the case for me. 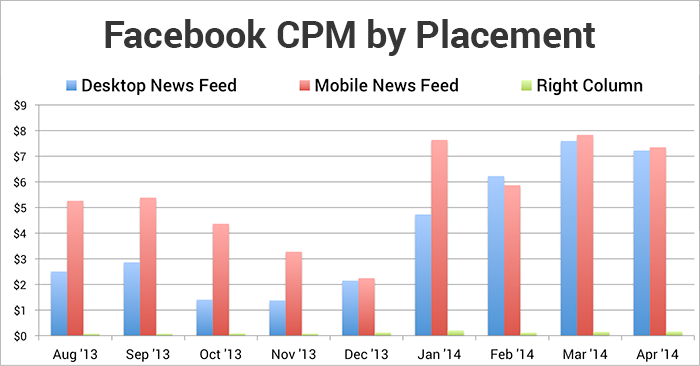 CPM for desktop and mobile News Feed is now nearly identical. Note that CPM doubled for the sidebar, tripled for desktop News Feed, and nearly doubled for mobile. There are many explanations for this, and we shouldn’t apply a global rule. I considered not reporting dollar figures at all since the ratio is actually most important. If I begin focusing on a smaller audience — or raise my budget for the same audience — oCPM prices are bound to increase. So I encourage you to focus more on the ratios. It now costs me 45 times more to reach users in the desktop News Feed and 50 times more to reach users on mobile than the sidebar. In other words, the ratio remained steady for mobile News Feed vs. sidebar, but price of desktop News Feed has increased. My Theory: Fewer users are accessing Facebook via desktop than ever before. Meanwhile, advertisers continue to favor this real estate. As a result of increased competition, prices are increasing for the desktop News Feed. It’s costing me quite a bit more to reach users now than it was at the end of 2013. So how is this impacting my Cost Per Page Like? 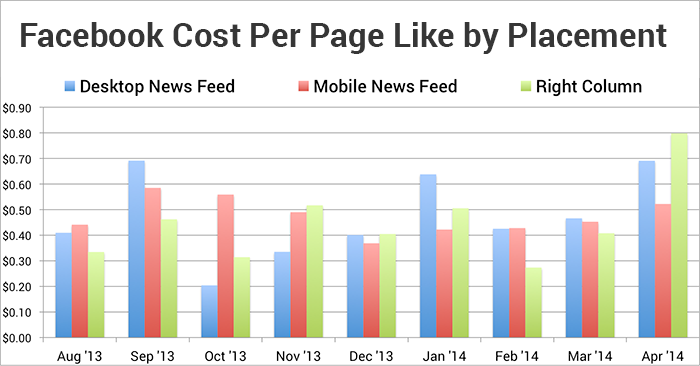 As you can see in the chart above, the cost of Page Likes has remained steady or even dropped on mobile; desktop News Feed is constantly evolving; and the sidebar is at an unacceptably high rate. Desktop was most efficient for me, whether in the News Feed or sidebar. The median cost is a bit misleading given the way costs are trending for me. I’m currently seeing a cost of $.80 per Page Like in the sidebar, which I cannot continue to spend. Mobile is currently easily my most affordable placement. Let’s also keep in mind that my ads may simply be less effective now. We can’t ignore that possibility. I continue to refresh them monthly. But generally, I’m seeing an increase in costs for Page Likes on desktop (especially for sidebar) while mobile is now more attractive. Once again, these results are based on my advertising only. This is not meant to be a universal report on how Facebook advertising costs are trending. This is what I am seeing based on the audience I target, the creative and copy I’m using and the budgets I set. The bottom line here is that the landscape is constantly changing. Monitor your results to determine the best possible placement for your ads. What results are you seeing? Is mobile becoming more affordable for you, too?